EuropaCorp has released the first trailer for director Luc Besson's (The Fifth Element, Lucy) sci-fi epic that looks to be one of the few original offerings next summer. Based on a long-running French comic Valérian and Laureline that was first published in 1967 Besson and his film have apparently "advanced" the material into a contemporary, unique and epic science fiction saga where the titular Valerian (Dane DeHaan) and Laureline (Cara Delevingne) are special operatives for the government of the human territories who are charged with maintaining order throughout the universe. Given the amount of nonsense that may sound like to some this teaser looks especially intriguing on a visual scale as we don't get too many story elements given it is, in fact, a teaser trailer. That said, I'm in for this weird mix of Besson's own Fifth Element (one can sense the similar production design in the cityscapes) and Guardians of the Galaxy. That more recent comparison will likely come to the mind of most movie-goers under the age of twenty-five as the trailer is accompanied by a classic pop song in the form of the Beatles, "Because," with the amount of strange creatures and space battles being more than reminiscent of that Marvel film. Of course, GotG fans will get their cake the first weekend of the summer movie season and with Valerian going head to head with Chis Nolan's Dunkirk opening weekend I'm curious to see how this $180-million epic is able to do. That said, the comparisons to James Gunn's film are likely only valid in terms of marketing as Besson has such a particular set of tendencies it's hard to imagine the final product resembling something as board room mandated as a Marvel movie. No matter the outcome and despite the fact I'll still be more anxious to see Dunkirk opening weekend I look forward to the potential this holds and hold out hope for something more along the lines of what Besson has crafted before rather than a Jupiter Ascending déjà vu. 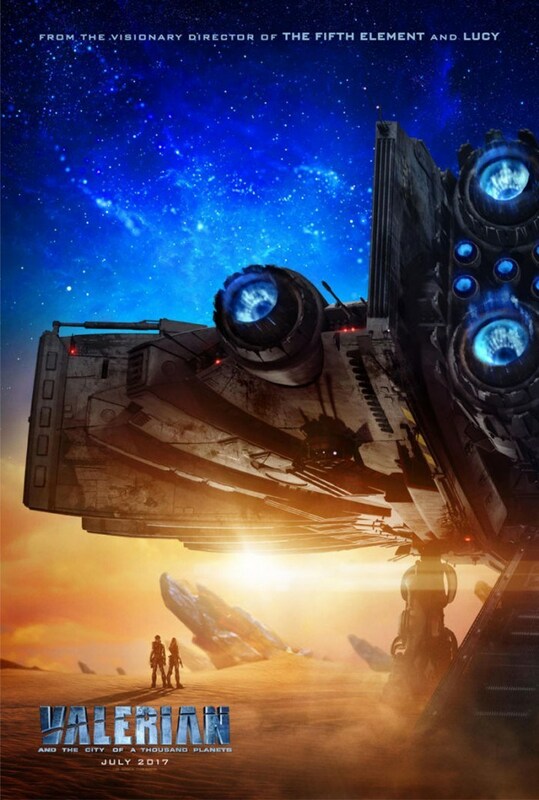 Valerian and the City of a Thousand Planets also stars Clive Owen, Rihanna, Ethan Hawke, John Goodman, Herbie Hancock, Kris Wu, and opens on July 21st, 2017. Synopsis: Rooted in the classic graphic novel series, Valerian and Laureline- visionary writer/director Luc Besson advances this iconic source material into a contemporary, unique and epic science fiction saga.